If you don’t receive an email with your login data within the next few minutes, would you please check: Did you get yourself already registered in our shop? If you did not, would you please do so during the order process. You can then define your own password. As soon as you are registered, you will be able to log in with your email address and your password. If you are sure that you are already registered in our shop, please check if there is maybe a typing error in your email address. 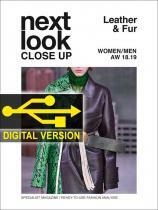 next look CLOSE UP series - a ready to use sophisticated and in-depth analysis. next look CLOSE UP combines the results of demanding and profound analysis of the most important shows worldwide with detailed views on the highlights - just CLOSE UP and TREND both! The next look CLOSE UP team are professionals of the creative industries. The team carefully analyses each of the collections to show in the magazine the essence of the trends and Close Up details for the upcoming season. A must have for all that are involved in a creative process, from design to buying and selling creatively. In other words the perfect useful and inspiring tool for buyers, retailers, wholesalers, designers, product developers and merchandisers.